One of the most prolific artists of his day, Steen has left us some of the most vivid portrayals of the social life he witnessed, often with humorous or moralistic overtones. The men depicted here are probably members of the guild of Rhetoricians (Rederijkers), a group of poets and dramatists who banded together for fellowship, readings, and theatrical performances. These organizations, which could be found in the major towns of seventeenth-century Holland, were often the subject of paintings from the period. Here the prominent coat of arms hanging from the sill bears the emblem of the Amsterdam guild of Rhetoricians called "Egelantiers," a flowering eglantine, and their motto, "flourishing in love" (in liefde bloeinende). 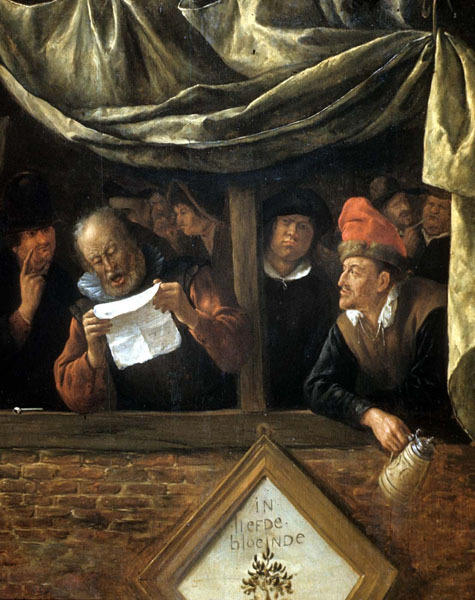 The man on the right wearing a beret has been identified as Steen, who frequently included himself in his paintings. As far as we know, he was never a member of the Egelantiers.